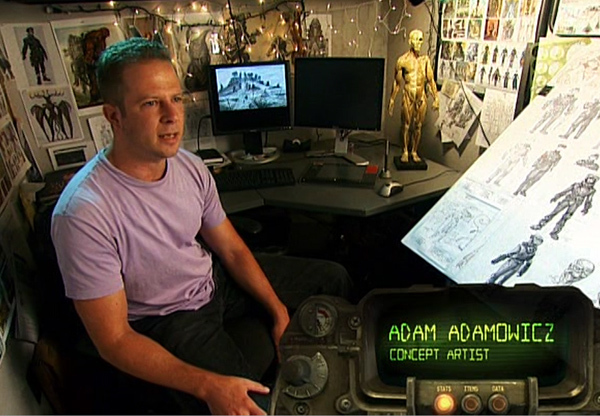 Visual designer Adam Adamowicz, who contributed/led the visual/concept design of Skyrim and Fallout 3 among other video games, passed away from lung cancer on February 8, 2012. His work was inspired, and the world of visual design has a huge hole to fill. Adam was 43 years old and died way, way too young. Adam Adamowicz, one of the main concept artists behind Fallout 3, Skyrim and other Bethesda titles, passed away today. It was silently announced, but I’d like to shine some light on Adam because he was an anomaly in the game industry, a veritable one-man conceptual machine, who unlike his contemporary counterparts, did a majority of his work in non digital mediums. Fallout 3 was pretty much visually designed from the ground up by one humble man who got little to no recognition, nor sought it. Adam Adamowicz, Artist for Lush Video Game Worlds, Dies at 43 – NYTimes.com ~ The New York Times obituary. Lots of stories and information about Adam’s life. Well done. Very cool they did this for him. He deserved it.